Capital Economics accuse those forecasters who see the GBP/EUR exchange rate falling to parity over coming months of being too pessimistic on the economy's prospects. Those wanting a stronger British Pound against the Euro will have been spooked by the recent views coming out of some of the world’s most esteemed research houses. Last week we were first to give an indepth report into Morgan Stanley's downgrade of their forecast for the Pound to Euro exchange rate which sees a fall to 1.0 as being likely in early-2018. And we have since reported that arch-bears HSBC Holdings are sticking to their guns with their forecast for the Pound to fall to 1.0 against the Euro, but they see the fall coming as early as year-end 2017. In both cases a negative view on the impact of Brexit is the prime driver of expected Sterling weakness. But, the consensus in the analyst community suggests the exchange rate ends the year above 1.10, so these views might yet be proven to be extreme. Capital Economics - who have long been on the more positive side of the Brexit debate with regards to the UK economy - say they expect the British Pound to recover against the Euro into the end of 2017. "In contrast to a number of other forecasters who have suggested that the pound could reach parity with the euro before the end of the year, we think that there are a number of reasons for the pound to reverse some of its recent losses against the euro," says Paul Hollingsworth, UK Economist at Capital Economics. Sterling has fallen by 7.5% against the Euro since mid-May and Capital Economics - who are an independent research institution - say they don’t share other forecasters’ pessimism about the prospects for economic growth, for either the near term, or the lead up to Brexit itself. For the consensus forecast for GDP growth of 1.5% this year to be realised, quarterly growth would have to average just 0.2% in the second half of the year, whereas Capital Economics expect a modest acceleration from 0.3% in Q2 to 0.5% or so in Q3 and Q4. "Indeed, we think that the official data should start to reflect the more optimistic business surveys which point to quarterly growth of about 0.5%," says Hollingsworth. Furthermore, it is suggested Q2’s weakness partly reflected falls in volatile output sectors (such as pharmaceuticals) which could well be reversed. And there have been some more encouraging signs that net trade should finally begin making a positive contribution to growth, helping to offset the slowdown in consumer spending growth. At the same time, Hollingsworth believes there is clearly a limit to the extent that improving sentiment towards the Eurozone’s economic recovery can continue to provide a fillip to the single currency. While Capital Economics expect the Eurozone economy to outperform the UK’s this year to a similar degree as the consensus, they think that other forecasters are being much too pessimistic about the UK’s growth prospects next year. Sterling’s current weakness against the Euro also does not appear to be justified based on its past relationship with relative interest rate expectations in the UK and Eurozone. This expectation is widely held to be the driver of Euro outperformance in 2017 which has seen the currency outperform all its major competitors in the G10 complex. Capital Economics dated August 14 says inflation will be key to any rebound in the Pound’s fortunes. “If domestically generated inflation in the UK and US increases as we expect, investors’ focus will return to conventional monetary tightening which would stem the Euro’s gains,” say the authors of the report. Accordingly, rather than fall further as many expect, Capital Economics think that some of the recent weakness of Sterling against the euro will be reversed, leaving the exchange rate at €1.13 at year-end, slightly above its current level of €1.10. Is the fall in value of Sterling impacting your international payments? Get up to 5% more foreign exchange by using a specialist provider by getting closer to the real market rate and avoid the gaping spreads charged by your bank for international payments. Learn more here. So with inflation being one of the underpinnings of any potential recovery in Sterling, Tuesday's release of UK CPI data will not be welcomed by those looking for a stronger Pound. The key data to watch from a currency perspective was always going to be core CPI - this is the inflation generated by domestic demand and reflects organic strength in the economy. Core CPI was forecast at 2.5% but came in at 2.4%. The headline CPI figures was forecast to read at 2.7%, up on last month's 2.6%. but read at 2.6%. The latest data might suggest the UK's bounce in inflation will peak before it reaches 3% - a level seen by many economists as being the top in the current round of increases. The impact on Sterling on suggestions that the Bank of England might not have an inflationary headache on its hand has been predictable - with no interest rate rise looking to be increasingly distant, the Pound is down. The Pound to Euro exchange rate has reversed earlier gains and now sits at 1.0993 while the Pound to Dollar exchange rate is decisively below the key 1.30 level at 1.2925. 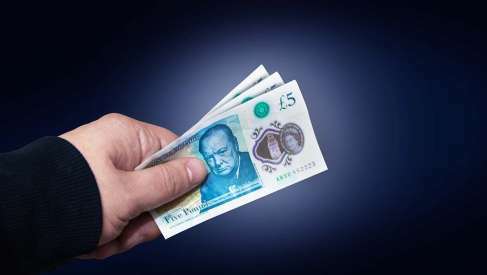 Yes low inflation should be bad for Sterling in that the need for interest rate rises at the Bank of England is diminished, but it is also good for consumers. After all, much of the recent slowdown in the economy is because consumer purchasing power has been diminished by rising prices. So surely falling inflation is good for the Pound? The Pound simply can't win. But UK inflation remains well above the Bank of England's 2% target and would typicaly justify a tightening of monetary policy by the Bank. Capital Economics are betting that markets will see UK inflation in a different light once economic growth accelerates in line with their expectations. The all-important Brexit front has seen some developments over recent days with the UK publishing the first in a set of position papers covering their position on Brexit. The first paper sets out an intended transitional period via the implementation of a bespoke customs union to come into force on the day the UK exits the European Union in March 2019. Wednesday, August 16 sees the release of a second position paper - this time on the Irish border. British and European negotiators need to show “flexibility and imagination” to devise post-Brexit arrangements on the island that preserve free movement of people and goods across the border, the Brexit Department said in an overnight statement. “Top of our list is to agree upfront no physical border infrastructure — that would mean a return to the border posts of the past and is completely unacceptable to the U.K.,” the department said.